It's time for a color challenge at CAS Colours & Sketches and the Design Team has some wonderful inspiration to get you started. By the time you read this, I'll be covered in snow so I thought I'd like to make some pretty flowers to help me forget that's it still winter. For all the challenge details and to share your project, visit the CAS Colours & Sketches Challenge by clicking the image below. We'd love to have you join us. You have until Monday, January 12th at 6:00 p.m. Central Time to link up your project. Sweet card, Marsha. I like the flowers off the edges! Beautiful card! I'm covered in snow too. 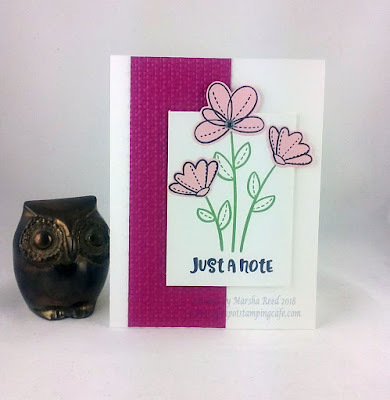 Fabulous use of the colours and the embossed cardstock really draws your eye to those cute flowers. Beautiful card design those flowers hanging over the edge are so eye-catching! P.S. Feel welcome to send some of the snow my way! Thanks, Patricia! You can have it all! Love this Marsha. It's so graphic and fresh. I have similar stamps, you've inspired me to get them out!